Effectively eliminate chromate overspray by selecting one of three economical Paint Pockets Aerospace Filtration Systems. These systems are the only factory certified aerospace filtration systems to utilize the patented Paint Pockets overspray arrestors as their first-stage. Use of the Paint Pockets as the first-stage extends the life of our final stage filter due to Paint Pockets higher efficiency and high holding capacity. Below are answers to some common questions regarding our Aerospace Filtration Systems. Doesn't the EPA require a three-stage filtration system for new sources? NO. Per the Federal Register Document 40 CFR Parts 9 & 63, section II, subsection G, paragraph 2: "The agency (EPA) also purposed that new sources meet the filtration efficiency data points for the three-stage system that was tested. Specifically, the agency purposed requiring owners or operators of new sources to use particulate filters that are certified under §63.750 (o) to meet or exceed the efficiency data in tables 3 & 4 of §63.745 (developed from the three-stage filtering system). These new filtration requirements reflect a performance based standard rather than specified equipment, thus allowing more flexibility for affected sources to comply with the NESHAP." Performance, not equipment, is the only stated requirement. Can I use your PPM-319 XL filtration system in a new installation? YES, independent laboratory testing proves that Paint Pockets two-stage PPM 319 XL filtration system exceeds the performance requirements of EPA method 319 for new installations. However, for those individuals still concerned that they must use 3 filters, we recommend putting 2 layers of Paint Pockets in front of our PPM 319 XL bag filter. Then, at first-stage change-out time, rotate the second Paint Pockets to the first position and install the new Paint Pockets in the second position, thereby fully utilizing the holding capacity available in each Paint Pockets filter. In current three-stage systems, where the second-stage is left in place, any previously captured finish retained by the second stage creates additional pressure drop that shortens the life expectancy for the newly installed first-stage. How is holding capacity related to the cost of using a filtration system? Paint Pockets M-319 XL System has almost double the holding capacity of Company A's system and uses only 2 filters instead of 3. Why is efficiency important for the filters in front of the final filter? 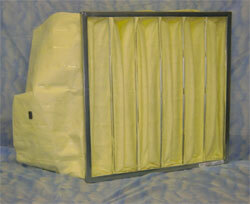 It is the final filter that allows a system to pass the Method 319 testing. This capability carries a high cost. The purpose of the filters upstream of the final filter is to protect the final filter from as much overspray as possible. The more efficient the filters in front of the final filter, the smaller the amount of overspray reaching the final filter and the longer the final filter will last. Paint Pockets overspray arrestor is the ultimate first-stage filter because its high efficiency and its unique three-dimensional design allows the filter to stay longer and still provide excellent protection to the filter behind it. 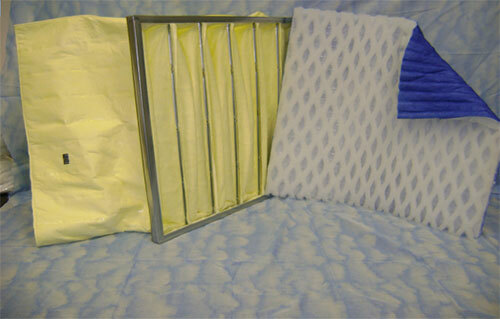 This extended life bag filter has a higher holding capacity than typical final stage bag filters. Used in tandem with Paint Pockets patented overspray arrestor, this two-stage system meets the new installation requirements for Method 319 (test results available) making it the most economical way to manage chromate overspray. Converting from Pads to Rolls Pays HUGE Dividends! 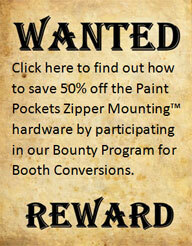 Click here to found out how converting your booth from pads to rolls can save your company money, and how Paint Pockets® makes the process easy.